Let them know that your biker bar is open for business with plenty of 'Bikes - Beer - Babes'. Your biker buddies will appreciate your vintage, cruiser-inspired bar sign. 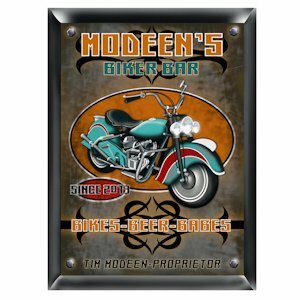 Be the namesake of your very own tavern with our Personalized Biker Bar Sign. Full color image features a retro motorcycle and great graphics. Perfect for the man cave, family room or wherever bikers might rest their weary bones.